Speeding along U.S. 70 at 60 miles an hour through the community of Glencoe, it’s easy to miss a small, rock chapel with connections to much of Lincoln County history and several mysteries. St. Anne’s Chapel sits in a hole, surrounded by trees. Located just east of Devil’s Canyon road, St. Anne’s Chapel, built between Roswell and Alamogordo, is the area’s first Protestant church. Construction began in 1933 and the chapel was completed in 1934. It was named in honor of Helena Anne Watson Tully, mother-in-law of Frank Coe, one of the participants in the famous Lincoln County War. 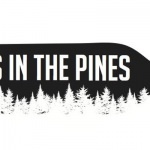 “My grandfather was Frank Coe and my grandmother was Helena,” Nellie Ruth Jones said. “(Helena) was instrumental in St. Anne’s Chapel being built. It (the chapel) was built on a hill,” Jones said. “When the highway was being built in 1965 they raised the highway 16-feet, so that put St. Anne’s down in a hole. That’s when it became the chapel in the hole,” she chuckled. Helena, an Episcopalian, was from Canada and there were no Episcopal churches for her to attend in the Hondo Valley. “They had services there at my Aunt Sydney’s (Coe Bonnell) house,” Jones said. Fredrick Howden, Jr. was the Rector at St. Andrew’s in Roswell and he traveled to Glencoe to conduct services. He started the monetary collection to build a church in 1933. “One Sunday he took up the collection plate and said, ‘This is the beginning of a plan to build a chapel here,’” Jones shared. 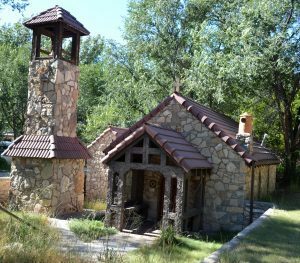 Since the completion of St. Anne’s Chapel in 1934, there have been some mysterious things happen to the little chapel built from rock in Devil’s Canyon. You will find on a visit to the chapel that it is never locked. You will also find the stained original Charter hanging on the back of the side door. Why is the Charter water stained? Because of a flood–“That was in ’65, June 17th,” Nellie said of the flood that left a water stain on the church Charter. “You don’t forget a flood like that. 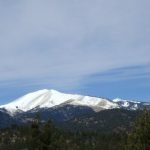 There was a heavy rain in Ruidoso and it flooded from Biscuit Hill on down.” Biscuit Hill is the area where U.S. 70 crosses the Rio Ruidoso in Ruidoso Downs. The area also flooded in 1981 and in 2008 when substantial rains fell on the mountains near Ruidoso. “So, when there is a heavy rain we get flooded here at St. Anne’s,” Jones explained. 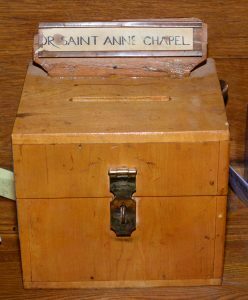 A donation box sits on a back pew near the front door of St. Anne’s Chapel. Visitors Contribute to the up-keep of the chapel. Along with the door at St. Anne’s you will find the donation box unlocked. That begs the question, ‘Why is the cross bolted to the altar?’ After one of the floods the Charter, along with the chapel’s cross disappeared. “It (the Charter) turned up in Roswell,” Jones said. “A priest in Roswell had it. A really nice, nice man.” The Charter, now water stained, was returned and rehung on the side door. In the conversation with Ms. Jones the question was asked about why are there two organs in the church “The one in the back is one we have had for several years,” Jones remarked. “The one in front of it is one that was in a Cloudcroft church. They closed and just abandoned the organ so it was brought here and put it in St. Anne’s.” She added, “We now have a third organ because a lady in Roswell returned the original St. Anne’s organ that my Aunt Sydney had bought at Ginsberg’s Music in 1933. I don’t know how in the world this lady ended up with it, but she gave it to my cousin, Irene Nosker, in September 2017, saying that she thought it should be owned by the members of the church. “So we have one little chapel and three organs,” Nellie said with a laugh. For more about what’s going on and history of New Mexico visit our partner site, Focus NM.